Download our brand new companion of readings for each of the days of Chanukah. Thank you to Rabbi Sylvia Rothschild for compiling the readings. Chanukah Sameach! This entry was posted in Education and tagged BFRHR, Education, RHR on December 9, 2014 by Rabbi Lea Muehlstein. Rabbi Na’amah Kelman, Dean of the Jerusalem campus HUC-JIR, the Reform movement’s rabbinical school in Israel, long term RHR member and current RHR Advisory Committee member. You can read more about her here. This entry was posted in Uncategorized on April 7, 2014 by Rabbi Lea Muehlstein. Two members of British Friends of Rabbis for Human Rights wrote op-eds for Jewish newspapers to draw broader attention to the situation of the Bedouin in Israel and to mobilise more support for the campaign to stop the legislative process of the Bill on the Arrangement of Bedouin Settlement in the Negev through the Israeli Parliament. Rabbi Alexandra Wright wrote on June 13, 2013 in the Jewish Chronicle: ‘All is desolation and destruction’. Read the full op-ed here. Rabbi Jonathan Wittenberg wrote on June 23, 2013 in the Jewish News: “Let’s show Israel is based on Jewish value of justice”. Read the full op-ed here. He also wrote on July 15, 2013 in Haaretz: “Every Jew should see the Bedouin issue as test of Israel’s moral values”. Read the full op-ed here. This entry was posted in Advocacy and tagged Advocacy, Bedouin, BFRHR, Israel, UK on July 18, 2013 by Rabbi Lea Muehlstein. The international press has given extensive coverage to the letter signed by 65 UK rabbis under the auspices of British Friends of Rabbis for Human Rights to protest against the Bill on the Arrangement of Bedouin Settlement in the Negev. 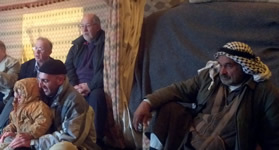 This entry was posted in Advocacy and tagged Advocacy, Bedouin, BFRHR, Israel, UK on July 16, 2013 by Rabbi Lea Muehlstein. 65 Rabbis from the Orthodox, Liberal, Reform and Masorti movements of Great Britain this week have joined together to sign a letter of protest to the Prime Minister of Israel, Benjamin Netanyahu, Ministers Yair Lapid (Finance), Tzipi Livni (Justice) and Meir Cohen (Welfare and Social Services), demanding that they stop the legislative process of the Bill on the Arrangement of Bedouin Settlement in the Negev through the Israeli Parliament. A copy of the letter, written under the auspices of the British Friends of Rabbis for Human Rights (BFRHR) was delivered to His Excellency, the Israeli Ambassador by Rabbi Laura Janner-Klausner (Chair of BFRHR) and a delegation from BFRHR on Thursday 6th June. The BFRHR letter appeals for a proper consultative process with Bedouin men and women to settle land claims and recognise the Bedouin’s historic rights to their lands, leading to the provision of proper services for their villages and attention to the long-term needs of the Bedouin. The Rabbis warn that the Bill is likely to do serious damage to the international reputation of the State of Israel. Spokesperson for the BFRHR, Rabbi Alexandra Wright added that the Bill is unjust and unfair in its discrimination against an impoverished and marginalised minority in Israel and that she earnestly hoped that the Ministers would, instead, provide a fair and compassionate process that would enhance Israel’s international standing. View/download the full text of the letter click here. This entry was posted in Advocacy and tagged Advocacy, Bedouin, BFRHR, Israel, RHR, UK on June 6, 2013 by Rabbi Lea Muehlstein. A great deal of effort is made by RHR in Israel to offer teaching on Jewish ethics to young men and women about to start their military service. 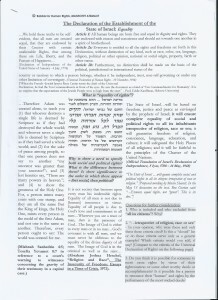 One important source for their studies is the Israeli Declaration of Independence with detailed references to the traditional Jewish teachings on which it is based. 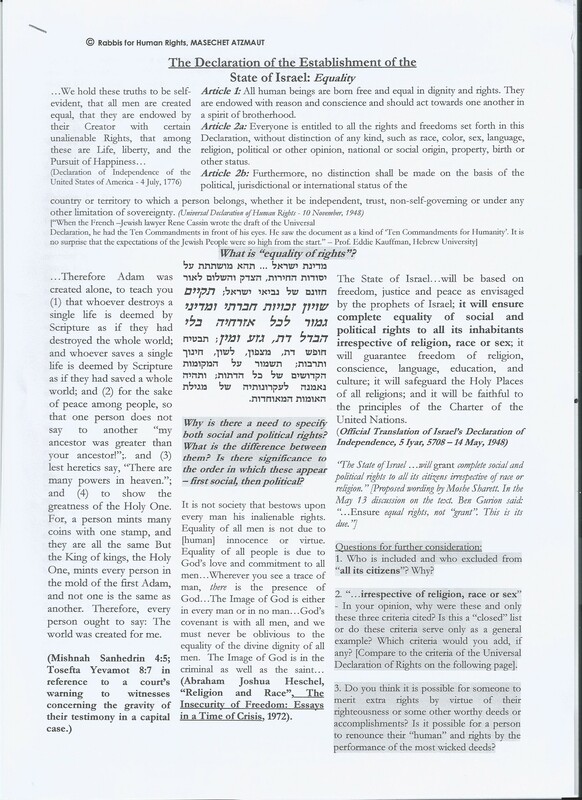 We reproduce below one page from their specially created “Tractate of Independence – Massekhet Atzma’ut” – anyone who would be interested to see more and possibly run some teaching sessions in their own communities should contact Rabbi Nava Hefetz at RHR Israel for more information. This entry was posted in RHR Update and tagged Declaration of Independence, Education, Israel, RHR on March 7, 2013 by Rabbi Lea Muehlstein.